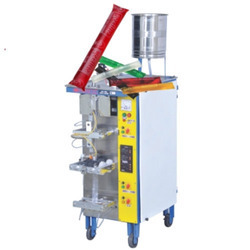 Prominent & Leading Exporter from Rajkot, we offer liquid packing machines. We are among the celebrated names in the industry for manufacturing and trading Liquid Packing Machines. The offered machines are made from high-grade stainless steel procured from a reliable vendor base for enhancing their resistance towards corrosion. These machines are ideal for filling and packaging pouches with beverages. Size: 20" x 43" x 32"
Packaging Size: 1" to 8" /2" to 11"
Double Die Width: 1" to 2.5"
Looking for Liquid Packaging Machines ?